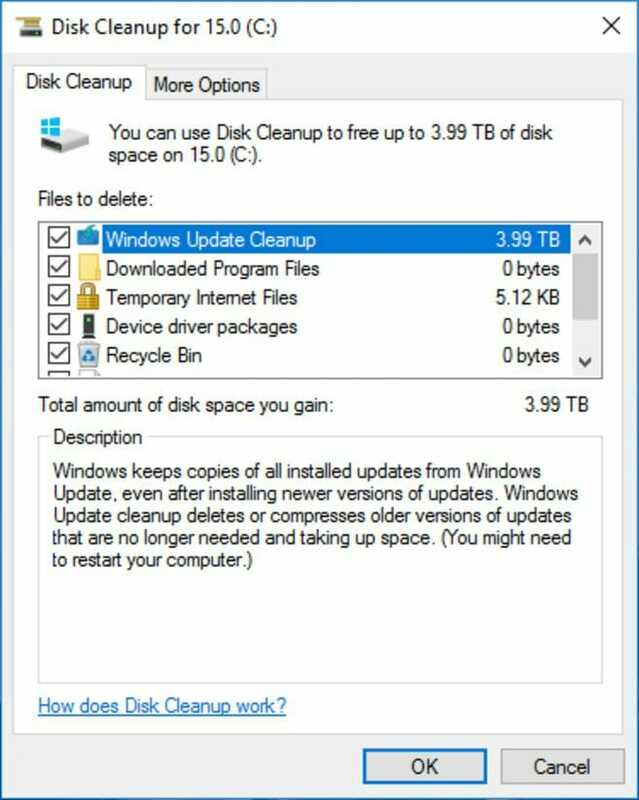 Why does Disk Cleanup have 3.99TB Windows Update Files? Since the last update, a lot of people are complaining about a bug in the Disk cleanup utility. For them, it is showing 3.99TB update files present in their C:\ drives. Your computer may have this bug too. Open C:\ drive properties and select Disk cleanup. If there are some files present for updating the system, you will see this figure 3.99TB beside the Windows Update Cleanup check mark. You will get this number even if the size of the storage disk on your computer is smaller than 3.99TB. It doesn’t matter what size the C:\ drive is. Of course, cleaning up those update files will free up some space on your computer. However, it certainly won’t make it lose the storage space that you don’t even have in the first place. So, why is the Disk cleanup utility showing 3.99TB of Windows Update Cleanup files? The reason is because of a thing called as a Hard link. You can read the excellent article that I linked to know about them. Basically, there is a folder at the C:\Windows\WinSxS called as Windows Side by Side. It stores different versions of the DLL and other system files on your computer. This is done to make sure that programs written for older versions of Windows work on the latest version or the one which you are currently on. This is why you are able to run 10-year-old games on the latest Windows 10 version. This folder contains a lot of hard links. This makes it very hard for the Disk cleanup utility to know what the actual size of the WinSxS folder actually is. This is why the number it reports sometimes gets miscalculated. In real, though, the Disk cleanup utility doesn’t check for hard links and this makes the calculations inaccurate. This causes the Disk cleanup to show an absurd number like 3.99TB when you try to clear the system update files. You can safely remove these update files and perform all other maintenance activities on your computer. It won’t cause any data loss.